Taking a family vacation with teens? Want some family bonding time, but don’t want to face “the look” all week long? You have two choices, take a friend along for your teen, or find a resort that offers specific teen programs. The friend option has its caveats – the biggest being that this is your family vacation, and if a friend tags along it becomes an, “us versus them” excursion. If you ditch the friend idea, opt for a destination that offers teen activities so that you can get your bonding time, but they can also meet new friends and actually enjoy the process. Which is worse – dropping a thirteen-year-old in a group lesson with a bunch of eight year olds screeching around the mountain; or dragging them through the day with a bunch of thirty-somethings who keep talking about their shrinking portfolios? Hello… teens are not kids; nor are they adults. They need their own program. Lodging: Can you teen come and go without you? Is the resort accessible to the mountain? Is there a recreation room or place to hang out? Wireless Internet? Ski or snowboarding lessons: Who teaches the group? What are the ages of group participants? Age of instructor? Apres Ski: While you’re thinking a hot toddy near the hot tub, teens are conspiring for an afternoon “meet & greet” with new friends. Is there someplace to go? Ice rink, tubing, heated pool? Evening activities: If the resort offers evening fun, what is the supervision like? Organized fun or just a place for hangin’? Arcades break the ice, as do whacky games or Karaoke. What exactly is a teen? Some include tweens (11 &12 year olds); while others want kids 15+. If both ends of the spectrum are grouped together, someone will be unhappy. Look for programs for tweens and young teens; and semi-organized fun for older teens (16+) that can’t sneak into the mountain bar scene. While your teen may look for the quickest escape route from your tight knit family activity; they also appreciate that very family time spent together, though they’ll never cop to it. 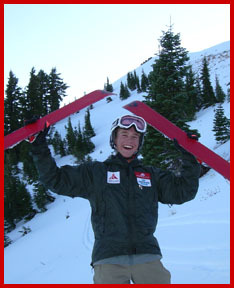 Schedule some one-on-one with both parents, as well as a family afternoon ski, ride, XC or snowshoe excursion. It will keep the family unit together, whining and all. ...... Tammie Thompson gets out with her teens as much as possible. It still doesn’t mean there aren’t any “lame” moments. Enjoy ‘em while you got ‘em!